Anaheim Ducks' Corey Perry, Ryan Getzlaf and Hampus Lindholm, from left, celebrate an empty net goal in the third period of an NHL hockey game against the Minnesota Wild in Anaheim, Calif., Sunday, Oct.18, 2015. The Ducks won 4-1. ANAHEIM, Calif. (AP) — A wooden plaque hangs on a wall in the Anaheim Ducks’ dressing room, with holes carved out for the game puck following each win. It took them five games this season to put one in. Anton Khudobin rebounded from a rough outing with 34 saves, and the Ducks got goals from Cam Fowler, Rickard Rakell and Mike Santorelli to beat the Minnesota Wild 4-1 on Sunday night for their first victory of 2015-16. "The first win is always the hardest," coach Bruce Boudreau said. "You get a lot of bumps and bruises when you win. When you don’t, you don’t usually get those bumps and bruises because you don’t pay that price. But tonight we’ve got a lot of sore guys in there because they paid the price. "Getting the two points is really important for the psyche of the group," he added. "Now we understand that we can score and play well at times. Hopefully it’s like snowball and it builds. I mean, we’re not out of the woods or anything, but it was a step in the right direction." Khudobin, who was pulled less than 13 minutes into a 4-0 loss to Arizona last Wednesday after giving up three goals on eight shots in his Ducks debut, got another chance against the club that drafted him in 2004. The only goal against him was by Nino Niederreiter with 7:05 left in the first period. "I really believed he was going to play good today because he’s been a good goalie all along," Boudreau said. "Sometimes you have a bad game and you throw him right back in. We were pretty confident that he really wanted to play tonight. They came on quite hard in the second and third period, but Anton stood tall." Minnesota goalie Devan Dubnyk, who made 21 saves, was pulled by coach Mike Yeo in favor of an extra attacker with 2 1/2 minutes remaining, and Hampus Lindholm’s empty-net goal capped the scoring with 1:09 to play. Rakell snapped a 1-1 tie at 16:01 of the opening period with the first goal by a Ducks forward this season. He redirected Lindholm’s one-timer past Dubnyk’s glove, after Corey Perry circled the net with defenseman Matt Dumba chasing him and fed the puck to Lindholm about 45 feet from the net. The Ducks, whose only goal during their first four games was scored by defenseman Sami Vatanen, opened the scoring at 10:08 of the first period with a screened 50-foot wrist shot by Fowler that beat Dubnyk low to the stick side. "I was just glad for the guys," Boudreau said. "You could just see the air going out of a big balloon. And it was the same for the people in the stands. That’s why I think they cheered for so long after that goal. They wanted to see a goal as bad as we did." The goal came less than two minutes after Minnesota’s Jason Zucker hit the crossbar from close range. Teammate Mikko Koivu also hit the crossbar with a one-timer from the low slot midway through the second period during a Minnesota power play. "We had a lot of chances," Koivu said. "Obviously, that’s a good thing. But it’s getting frustrating when you get those kind of chances and they don’t go in. We had empty nets and we hit crossbars and posts." NOTES: Khudobin played his first six NHL games with Minnesota during a span of two seasons (four starts), going 4-1 with a 1.40 goals-against average and one shutout. 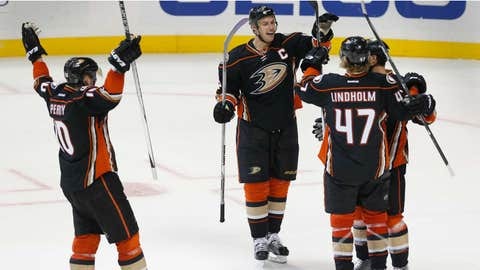 … Anaheim’s victory left Columbus (0-6-0) as the NHL’s only winless team. Minnesota’s defeat left Montreal (6-0-0) as the only club that hasn’t lost in regulation. … Anaheim was 0 for 2 on the power play, and is 0 for 13 altogether. … Shea Theodore, called up from the Ducks’ AHL club in San Diego along with Korbinian Holzer on Saturday because of injuries to Simon Despres and Clayton Stoner, made his NHL debut. Theodore was selected 26th overall in the 2013 draft, and Holzer was acquired from Toronto in March. … Stoner missed his third straight game due to a lower body injury. Despres suffered a head injury Friday night after taking a hit from Colorado’s Tyson Barrie, who received a three-game suspension from the league.